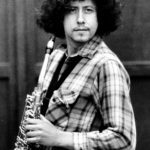 Arlo Guthrie is an American folk singer-songwriter. Like his father, Woody Guthrie, he is known for singing songs of protest against social injustice. Guthrie’s best-known work is his debut piece, “Alice’s Restaurant Massacree”, a satirical talking blues song about 18 minutes in length that has since become a Thanksgiving anthem. His only top-40 hit was a cover of Steve Goodman’s “City of New Orleans”. His song “Massachusetts” was named the official folk song of the state in which he has lived most of his adult life. Guthrie has also made several acting appearances. He is the father of four children, who have also had careers as musicians. "The death of what’s dead is the birth of what’s living."